The United States Army Heritage and Education Center (USAHEC), in association with the Army Heritage Center Foundation and the Ranger Group LLC., will be helping to kick off National Spirit of ’45 Day this year by hosting a tandem airborne jump by a 90-year old WWII veteran on August 13, 2011. 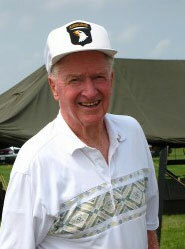 Richard “Red” Falvey will jump tandem with Ranger Group jumper and veteran Mike Elliott onto the grounds of the Army Heritage Trail. The jump commemorates Falvey’s 90th birthday and honors his jumps into Normandy on D-Day and his jump into Holland during Operation Market Garden. Born August 2, 1921, Richard “Red” Falvey enlisted in the Army in August 1942 and served in World War II with the 506th Parachute Infantry Regiment, 101st Airborne, as a sergeant in the Headquarters Battalion. Red jumped at 1:15 AM June 6, 1944, landing near Foucarville, France. He went on to serve with the 506th PIR and the 101st throughout the war in battles in Normandy, Operation Market Garden, and the Battle of the Bulge. During the siege of Bastogne, Falvey was wounded in action. He was awarded a Bronze Star during the war. Red is an active participant in reenactments and is a popular speaker for special events. In services company started by Mark “Ranger” Jones. The Parachute team is made up of veterans who take part in various events for the public. Elliott served in the United States Army for 20 years, and served in the 101st as well as long time rival, the 82nd Airborne. He deployed for Operation Desert Storm and Desert Shield and served in Iraq and Afghanistan. He has performed over 3,000 tandem jumps. The event will take place on Saturday, August 13, 2011 and will be open to the public. Also featured at the event will be an educational presentation on the D-Day invasion as well as an explanation of the USAHEC collection and the materials related to D-Day and Operation Overlord.